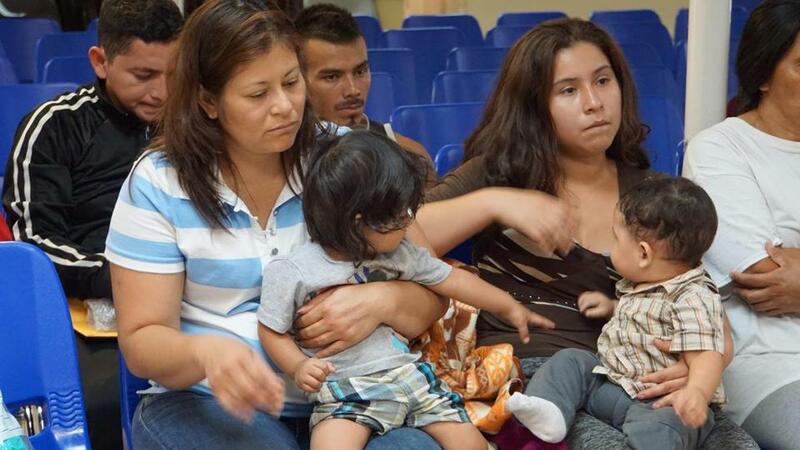 In this file photo taken on June 15, 2018 Mothers and children waited to be assisted by volunteers in a humanitarian center in the border town of McAllen, Texas. McALLEN, Texas — Inside an old warehouse in South Texas, hundreds of immigrant children wait in a series of cages created by metal fencing. One cage had 20 children inside. Scattered about are bottles of water, bags of chips and large foil sheets intended to serve as blankets. The U.S. Border Patrol on Sunday allowed reporters to briefly visit the facility where it holds families arrested at the southern U.S. border, responding to new criticism and protests over the Trump administration’s ‘‘zero tolerance’’ policy and resulting separation of families. The Border Patrol said close to 200 people inside the facility were minors unaccompanied by a parent. Another 500 were ‘‘family units,’’ parents and children. Many adults who crossed the border without legal permission could be charged with illegal entry and placed in jail, away from their children. Agents running the holding facility — generally known as ‘‘Ursula’’ for the name of the street it’s on — said everyone detained is given adequate food, access to showers and laundered clothes, and medical care. People are supposed to move through the facility quickly. Under U.S. law, children are required to be turned over within three days to shelters funded by the Department of Health and Human Services. ‘‘She had to teach other kids in the cell to change her diaper,’’ Brane said.